There are a wide range of seagull deterrents, and our pest control experts can help you to decide which will be best for you. Although seagulls may not be considered a typical pest the way ants or mice are, they can be both a real nuisance and a threat to your health and safety so it is a good idea to make sure they stay away from your property. There are a number of factors which make seagulls a pest, not least their squawking, aggressive behaviour and the droppings they leave. The aggressive behaviour is worst during their nesting season which is April-July. During this time they have been known to attack people who have come close to their nest, as a way of protecting their eggs. Seagull droppings are not only unpleasant to look at, but they can block gutters and cause structural damage to your property due to their acidity. When they are on the ground they are also a slipping hazard. For these reasons it is important to keep seagulls off your property, whether that be residential or commercial. Bird Netting. 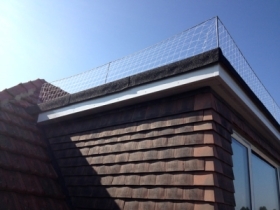 This can be put across large areas such as a roof, protecting your property from seagulls (and other birds, such as pigeons) perching and nesting there. Egg and Nest Removal. 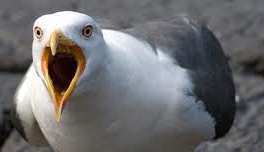 As mentioned, during their nesting season seagulls can become particularly aggressive. If you do have a nest on your roof, our trained pest control operatives can remove it for you. It is best to then have seagull deterrents installed to prevent the seagulls returning. Bird Spikes. These are most effective on ledges and parapets, although they can be expanded to cover larger areas. Audible Bird Scarers. By emitting the sound of a seagull's distress call, seagulls are scared out of the area. Requires on-going management by pest control operatives for maximum effectiveness. Electric Bird Deterrents. These thin strips of stainless steel carry a low current, giving any bird which perches on them an electric shock. The shock is harmless, but it does deter the bird from returning to the site. Falconry. If you have a larger area to protect, such as a car park, then falconry is one of the best pest control methods to keep seagulls away. A trained predator bird is released into the area at certain times, which scares the seagulls away and deters them from returning to the area.